A gold medal winner in 2006 this is a creamy smooth full bodied malt with hints of eastern spice and best chewy toffee. Not just for special occasions and it is on special offer now so don’t delay! 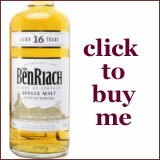 What Do You Think of 'BenRiach 16 Year Old Single Malt Whisky'? Rate It Below!